Odd Nerdrum, the Norwegian artist sentenced to two years in jail for tax evasion, won’t be allowed to keep painting in prison. He’s appealing his sentence, but if it stands, the 67-year-old Nerdrum will have to leave his brushes and easels behind. 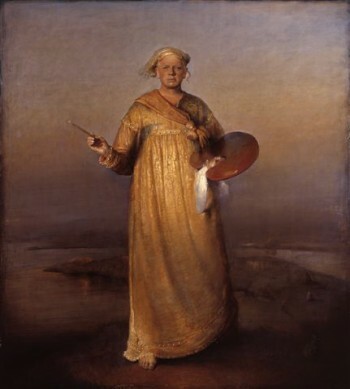 Odd Nerdrum in a self-portrait has been available for press use on his website. Newspaper Aftenposten reported that the Justice Ministry has stressed that convicted prisoners aren’t allowed to continue their business activities while held in custody. For someone like Nerdrum, who has lived off income from sales of his artwork, his passion for painting will thus conflict with regulations governing prison terms. It’s different for other convicts, who have been allowed to paint, read or conduct approved hobbies as a means of passing the time in jail. Aftenposten noted that convicted robber Johnny Thendrup, for example, sentenced to 13 years in prison for the commando-style NOKAS heist in 2004, took up his old hobby of painting while his case was pending. He has since continued to paint while incarcerated at the Ila prison for high-risk criminals outside Oslo. Nerdrum, however, won’t be able to do the same since his painting falls under the “business activity” category. Nerdrum faces a tough appeal, since the court ruling against him was so strong and made clear that the court didn’t believe Nerdrum’s explanation for millions in undeclared income. Legal analysts continued this week to marvel over how tough the ruling and Nerdrum’s sentence were, and his own defense attorney seemed to agree. It was just earlier this year that another Norwegian artist, Vebjørn Sand, was proposing that Nerdrum be awarded the right to live in Norway’s state-funded honorary home for leading artists called Grotten. Now it appears the state may wind up covering his living expenses after all, but under vastly different circumstances. Nerdrum has repaid taxes and fines owed and maintains his innocence, saying he wouldn’t have been able to paint if he had paid any more attention to numbers. The court seemed to believe that Nerdrum knew exactly what he was doing when he failed to report proceeds from art sales. While many in Norway support relatively stiff prison terms for tax evasion, Nerdrum has won support and sympathy in artistic circles. Editor and publisher Anders Heger, for example, said he’s long worried that authors and artists, many of whom earn very little and don’t have the funds to spend on lawyers and accountants, are expected to file tax returns like those of large businesses. Heger noted how author Agnar Mykle also landed in major tax battles with the authorities, and he thinks tax issues in general are problematic for artists. So does art professor Øivind Storm Bjerke. “There of course shouldn’t be exceptions for geniuses,” Bjerke told Aftenposten. “Artist Edvard Munch also had long discussions with the tax authorities.” But he called Nedrum’s prison term “strict,” and several others think there should be separate tax systems for business and cultural pursuits.